You look at your sneakers one day and feel that something is amiss. It doesn’t really reflect you as an individual. It is not uniquely yours; it is not custom-suited to you – the one rocking the kicks. With the proliferation of sneakers like the Nike Roshe, Nike Janoski Max and New Balance on the feet of teenagers and young adults nowadays, only the priciest of the crop stand out. They feature more elaborate, exclusive designs, and the celebrity endorsements that go along with them always help. However, the problem is that most of us don’t have the moolah to afford them. Fortunately in Singapore, sneaker customization is gaining track. Artistically inclined local sneaker enthusiasts are trying their hand on customizing parts of common sneaker models to create exclusivity without the hefty price. One team of such local sneaker enthusiasts are @peopleschampshop on Instagram. From incorporating trendy, whacky designs of The Avengers on Nike Swooshes to painting a fanboy-worthy Batman silhouette on Converse Chuck Taylors, you can tell that they have a passion for personifying sneakers. 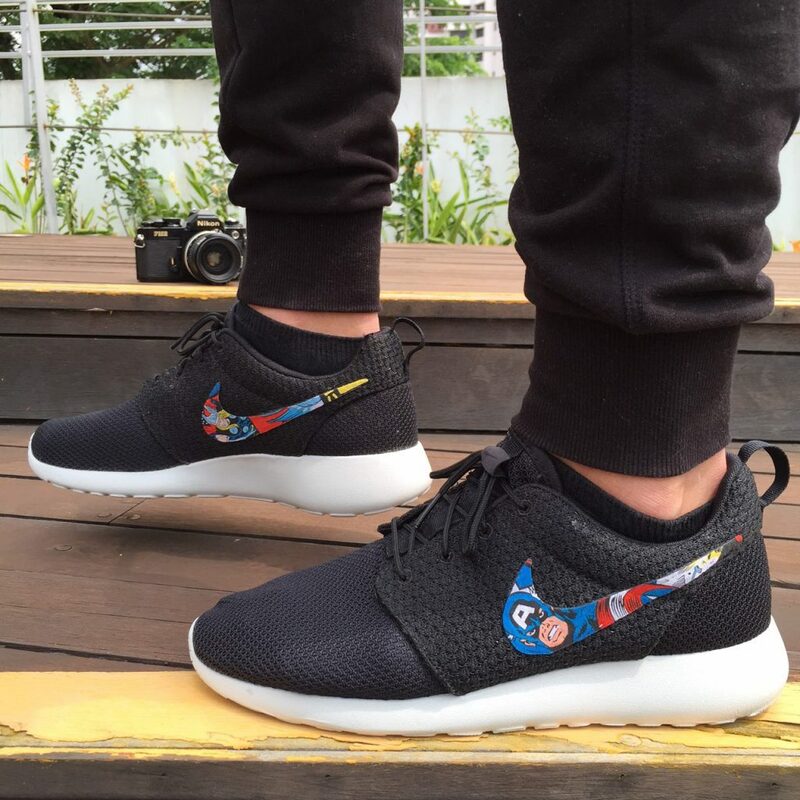 True enough, what caught our eyes was the Marvel Comic Patch Roshe that they released just over 3 weeks ago. If you are a Marvel fan and want to show it to the world, we recommend you get those, they’re heat. Oh, and check out this pair of Batman chucks. Bruce Wayne would be proud! Have you ever wondered how the designs conceived on canvas are eventually translated onto fabric? For painting, the right type and size of brushes as well as quality of paint is paramount in ensuring quality detail in the shoe’s customized design. For conventional fabric, Seng Tiong tells us that “using masking tape to wrap over the areas that desires to be customized” is the most crucial step. Mistakes can easily happen during the painting and fabric fitting stage, as they require precise outlining and sewing, as well as a very steady pair of hands. Despite the potential design slip-ups, most sneakerheads love the idea of donning on a pair of individualized sneakers. Janz Abdullah, 29, is the managing director of local clothing business Mona J. She says, “It’s about uniqueness. Not many people own that pair, so it makes you a unique individual.” Fellow sneaker enthusiast Kuek Tee Tiong, 19, says that people “like to be wearing something that others are not”. Still, there are some who are not too keen on the idea. Sneaker lover Timothy Ng, 35, a marketing manager, points out that once sneakers are customized, they “lose its originality”. Apart from @peopleschampshop, there are other options to look at such as @enchanted_inc and @i.e.d.customs. The former caught our attention with its rendition of a galaxy-themed pair of Chucks, while the latter impressed us by how well they managed to incorporate Tiger Beer’s design ethos onto a pair of Air Force 1’s. Shoes too plain and mundane? Well now you have no reason to complain! Check out local sneaker customization options offered by the growing number of passionate sneaker customizers today! Holla fellow sneaker lovers! What do you think of the growing customized sneaker trend? Are they a yay or a nay? Share your thoughts with us in the comments below!